H&H Land and Property this week launch to the market Whitbarrow Farm, a ring fenced, 200 acre, dairy farm with cutting edge DeLaval robotic technology, modern farm buildings, traditional farmhouse and modern bungalow. This is believed to be the first dairy farm complete with robotic milking systems to be brought to the market in Cumbria, and as such provides a unique opportunity for a keen dairy enthusiast to invest in the future of dairy production. For those seeking a future in the dairy industry, they need look no further, as this is a dairy farm which has already embraced futuristic technology. This farm really does provide someone with a keen interest in dairying with a once in a lifetime opportunity to invest in a productive, modern dairy enterprise with a robotic milking system already installed. With the current owner operating a fully housed dairy system, the farm is entirely sustainable in terms of forage as all of the high quality land is utilised for silage production. Whitbarrow Farm, which is located near Berrier, on the outskirts of the Lake District National Park, is available by Private Treaty with an overall guide of in the region of £1,880,000. The farm is being offered for sale through the Carlisle office of H&H Land and Property as a whole or in four lots. * Lot 1 being sold with a guide price of £1,550,000 includes 174 acres, the modern dairy complex with four DeLaval VMS Milking Robots, 240 cubicles, extensive cattle handling and forage facilities, farm buildings and a five bedroom farm house. * Lot 2 is a three bedroom bungalow with lawn garden extending to 0.85 acres and is being sold with a guide of £180,000. * Lot 3 is 12 acres of grazing land, split into two fields, benefiting from roadside access from the A66. This is being offered for sale with a guide price of £50,000. * Lot 4 is 15 acres of excellent mowing/grazing land with roadside access and is being sold with a guide price of £100,000. 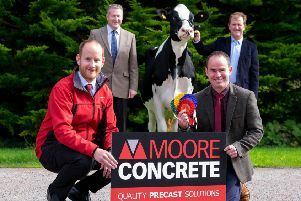 On launching Whitbarrow Farm, Thomas Armstrong, associate director and chartered surveyor at H&H Land and Property, said: “For those seeking a future in the dairy industry, they need look no further, as this is a dairy farm which has already embraced futuristic technology. This farm really does provide someone with a keen interest in dairying with a once in a lifetime opportunity to invest in a productive, modern dairy enterprise with a robotic milking system already installed. Whitbarrow’s modern dairy complex, with four DeLaval VMS Milking Robots, was installed in 2008 and updated to the latest software in 2016. A bulk tank room contains a 16,000 litre DeLaval bulk tank. The adjoining buildings contain a total of 240 cubicles with slatted floors and automatic scrapers. In addition, there is a cattle handling shed complete with facilities, a youngstock shed, calf shed, machinery shed, workshop, slurry storage, garage, two old dairy buildings with brick walls and fibre cement roofs, and slurry storage with a total capacity of 170,000 gallons (slatted channels and Simplex steel tower). Furthermore, there is also a dry cow shed, loose box calving pen, a lean to suitable for loose housing, calf shed, two general purpose implement sheds, a large indoor silage pit and a smaller indoor silage/straights pit, as well as an area of open yard. The five bedroom farmhouse which retains many original features is currently a running as a lucrative bed and breakfast; it also has the potential to be a stunning family home. Further information and sale particulars can be found online. For more information on Whitbarrow Farm, please contact Thomas Armstrong at H&H Land and Property’s Carlisle office on 01228 406260, or email thomas.armstrong@hhland.co.uk.